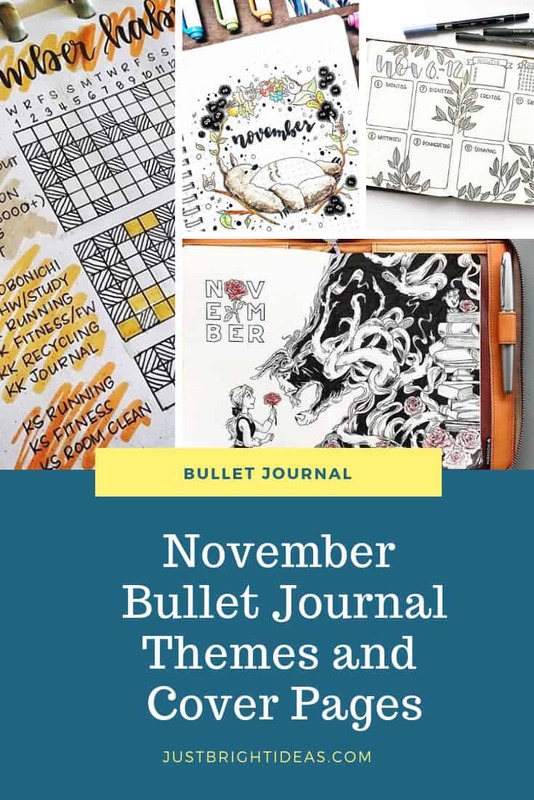 It’s time for some November Bullet Journal themes and cover page ideas to inspire you as you create your spreads for next month. 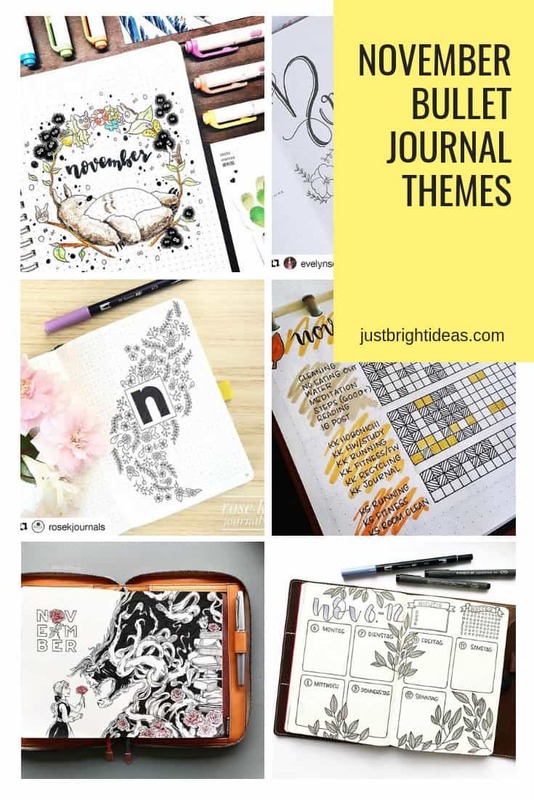 As always we have a creative mix of cover page ideas, themes you can try out to tie all of your spreads and layouts together, and some plan with me videos for those of you who like to have a sneak peek at what other people are doing in their journals! 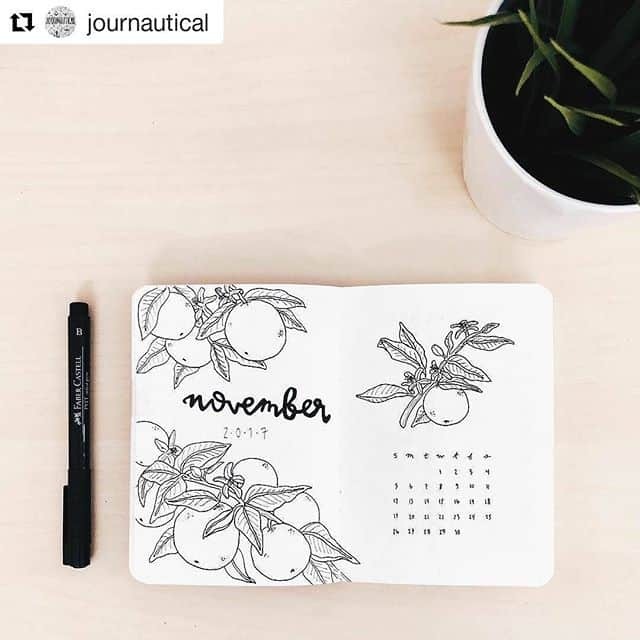 If you love florals try your own version of this beautiful November cover page. 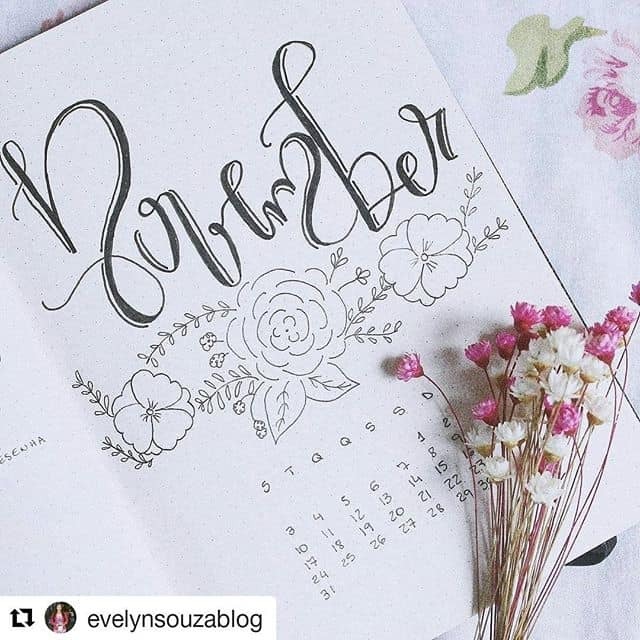 The hand lettering is beautiful (something I’m still practicing) and I like the addition of the calendar square. 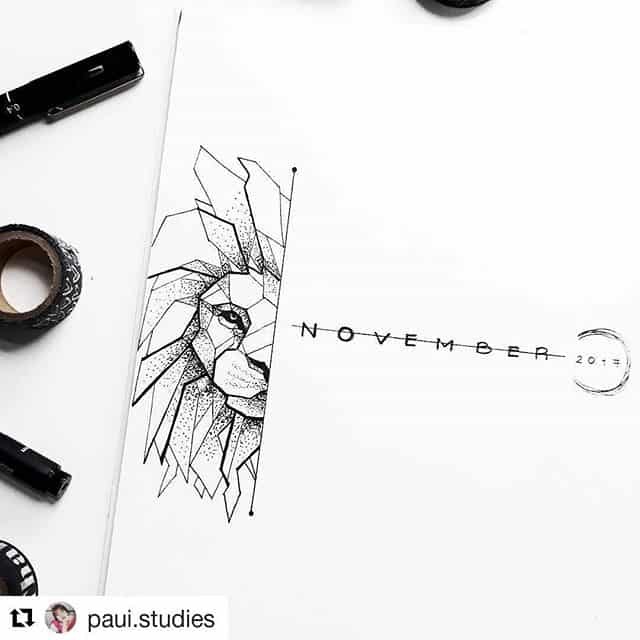 If geometric designs and layouts are your thing take a look at this amazing lion illustration! Wreaths are a popular choice for cover pages and I like how this one has a Fall feel with colours. 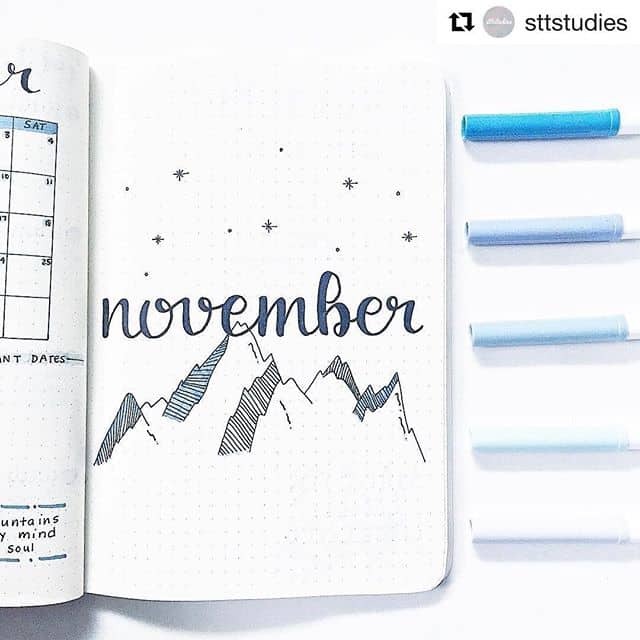 I often put my month cover page on the right hand page to kick off the month, but I think I’ll try a left side like this with a month “dashboard” on the right. This one includes the calendar, some important dates and the all important goal focus! When I think November I think chilly days, but if you live somewhere it doesn’t actually get too cold in November you might want to try a citrus theme instead. You could go monochrome like this or add a splash of colour! This cover page design is super simple but so striking! I love the little stars twinkling in the sky above the mountains. 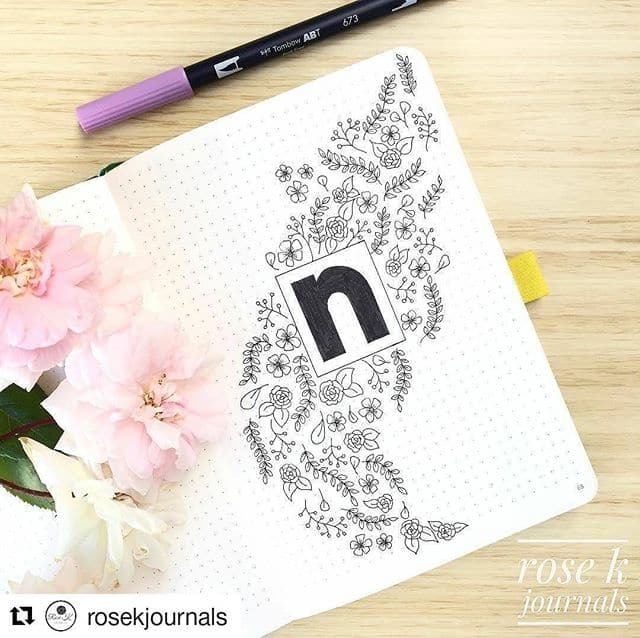 This floral doodle themed cover page is so striking and could actually work in any month of the year if you used seasonal flowers. 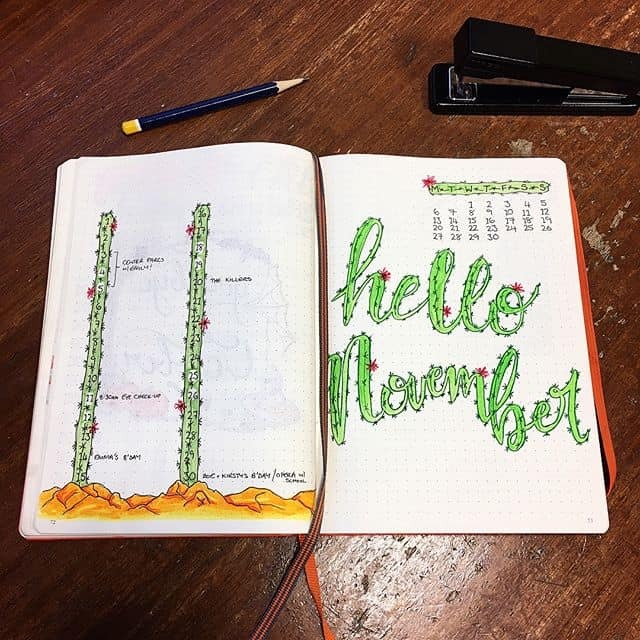 The cactus theme is still going strong this year and I love this fun Hello November cover page with the letters that look like cactuses (or is that cacti??) 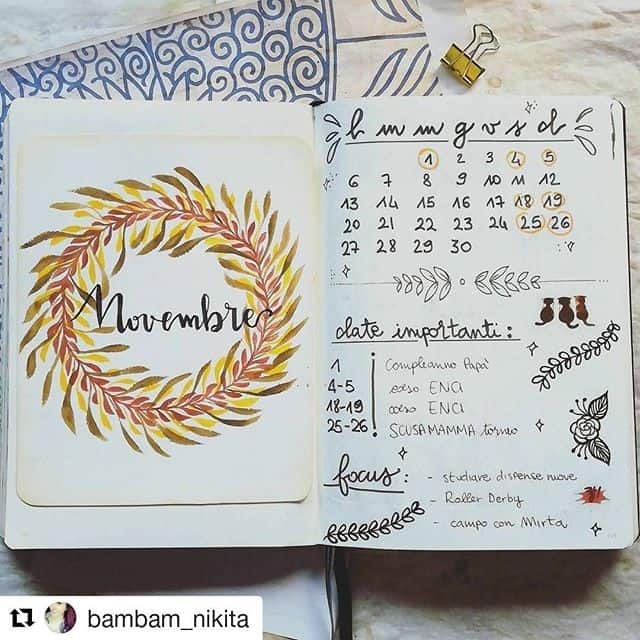 The month at a glance spread on the left is a clever idea too! 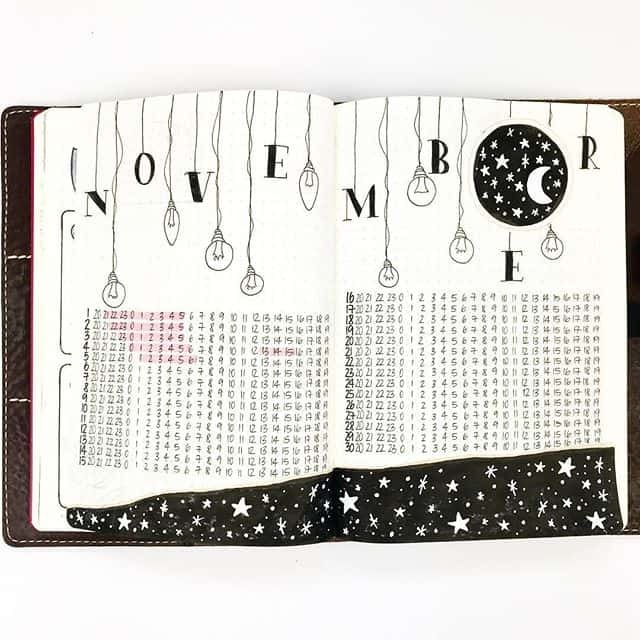 This is a creative twist on a cover page plus calendar design. 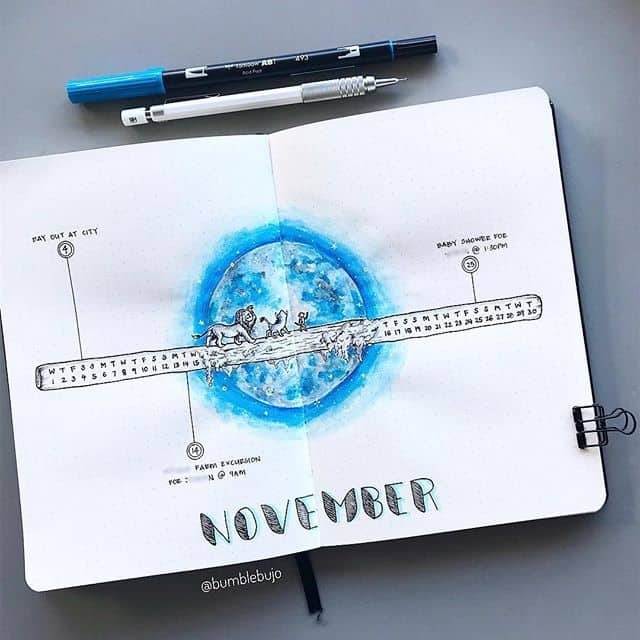 I like the horizontal bar for the dates, with Simba and his pals walking across the top! 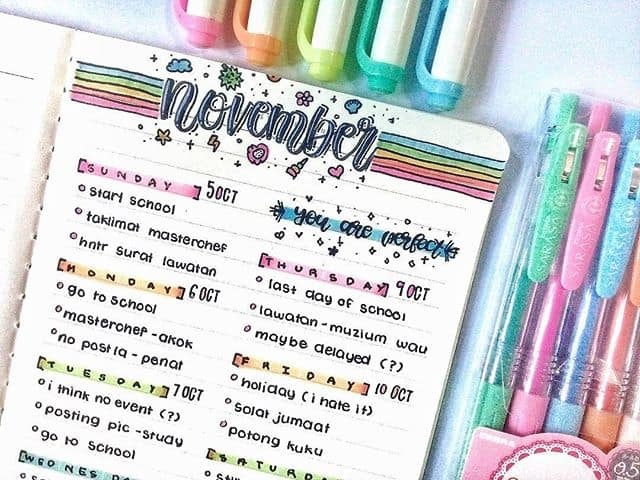 If you love all things rainbows and sparkles you’ll want to try your own twist on this cute November theme! I love the doodled, hand letter banner at the top, which would look great as a cover page on a larger scale. 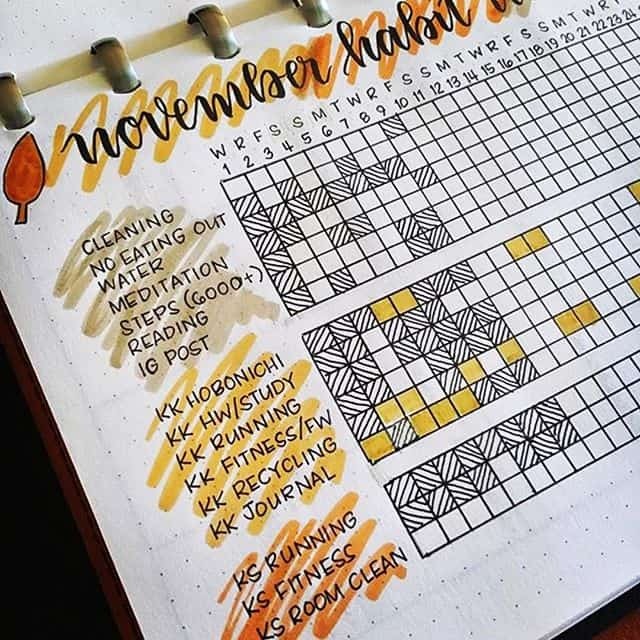 I really love these highlighter “scribbles” to add a splash of Fall colours to this November habit tracker spread. I totally need to try that cross hatch pattern on the boxes too! 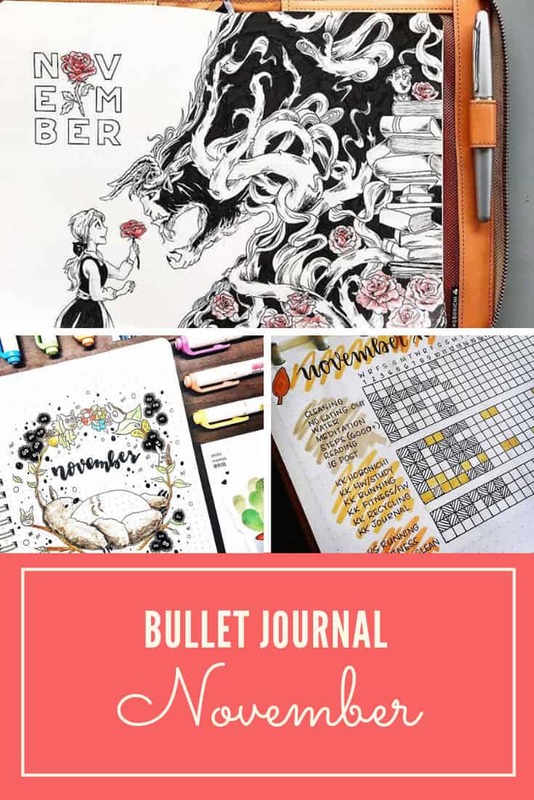 I can’t believe we got this far through the Bullet Journal eye candy without mentioning washi tape! 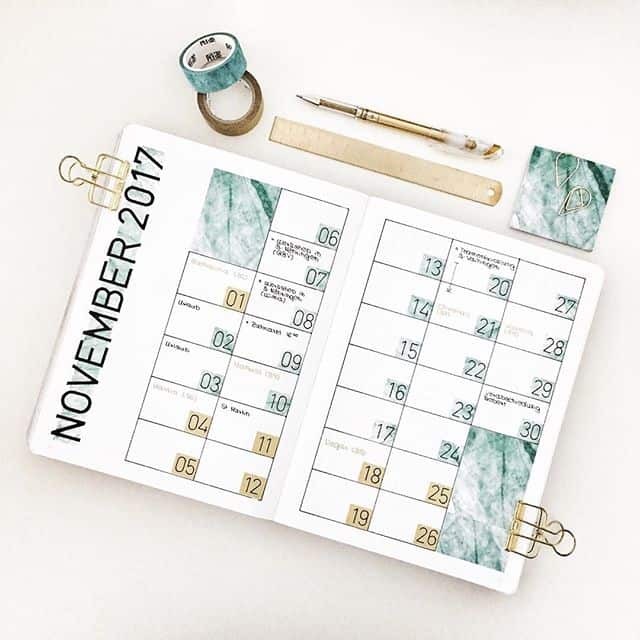 Marble is bang on trend this year and using washi tape to decorate your November spreads is a very clever idea! Oh my goodness how fabulous is this illustration of Totoro? And don’t you just feel like that during November! Ha! 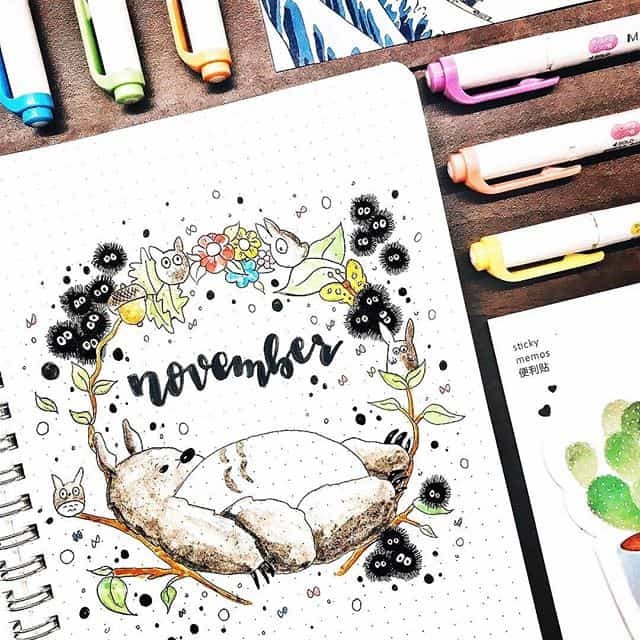 I think this is my favourite November cover page actually, because of all the little doodle creature details! Oh darn did I already call a favourite! 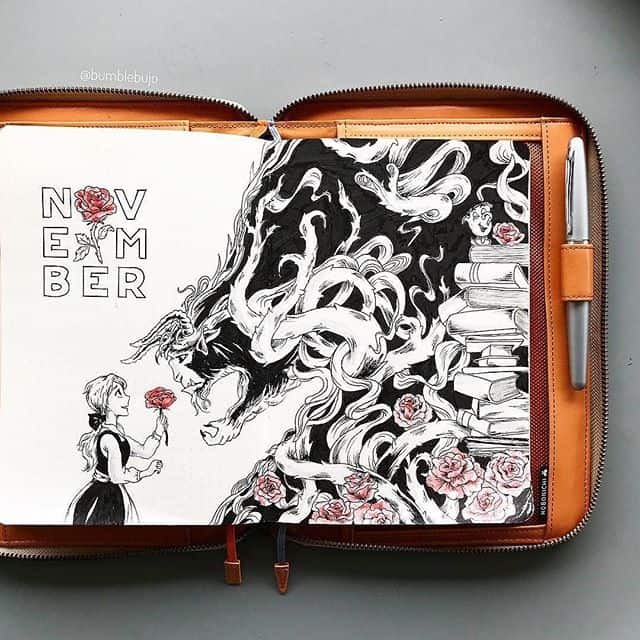 Beauty and the Beast is my all time favourite Disney movie and would you just look at this amazing November cover page! That Beast illustration is pretty magical! 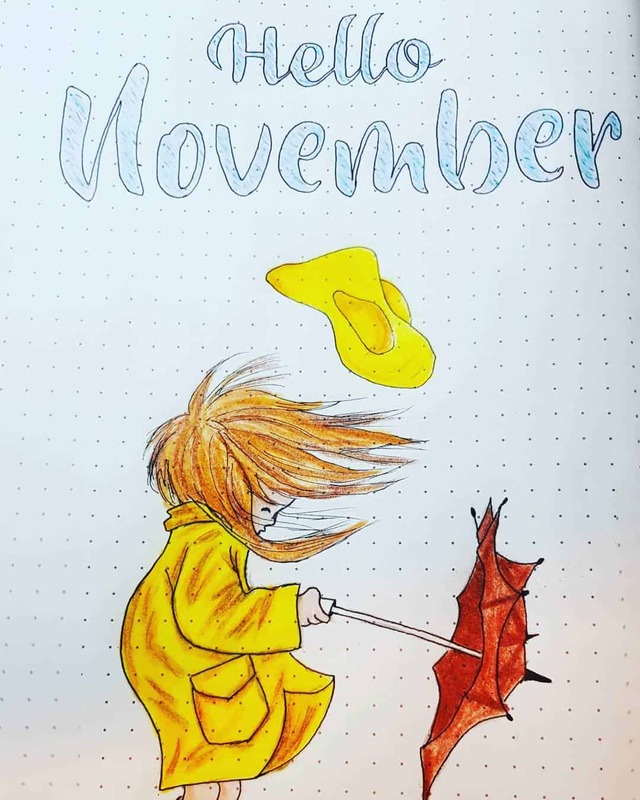 If it gets pretty blustery where you live in November you might want to try a cute cover page design like this one. 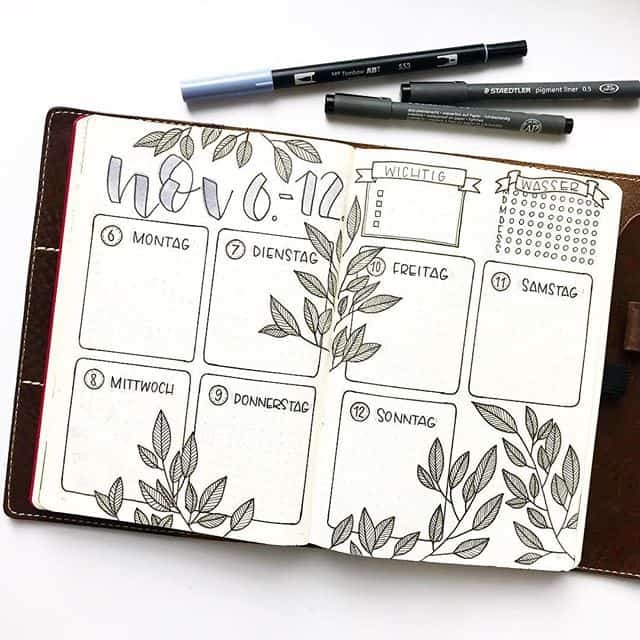 If you think leaves when you think November you might want to try a theme like this one. 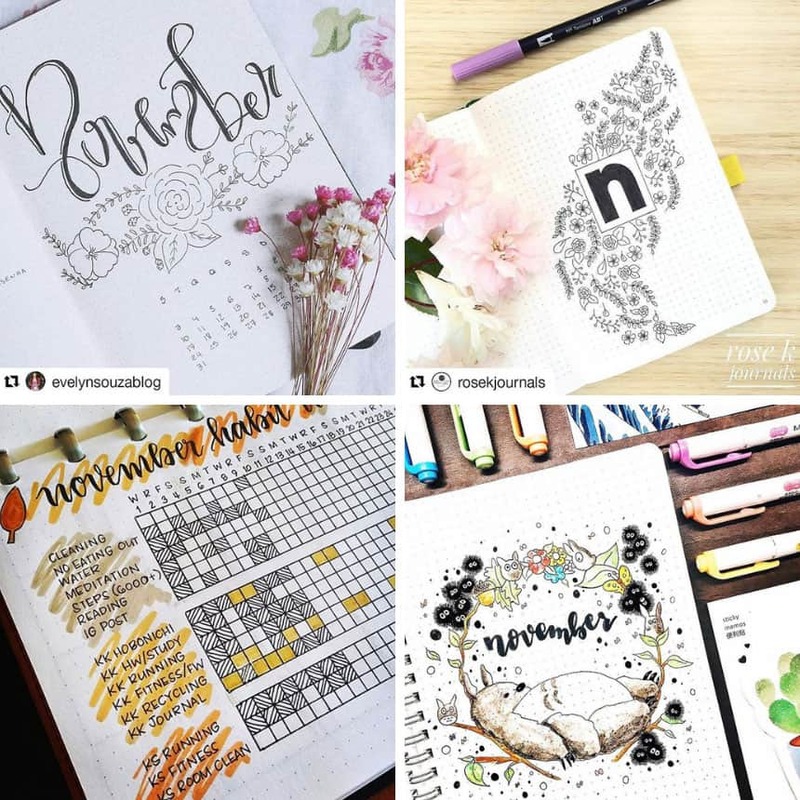 Again you can go monochrome or add a splash of colour with your tombows.